On 16 February 2012 has been confirmed in Italy the first case of Schmallenberg virus in a holding in Veneto in Treviso: a goat fetus felt that had malformations, subcutaneous edema, scoliosis, artrogrifosi, ankylosis of some joints of the limbs. The fetus tested positive for Real Time RT-PCR for virus Schmallenberg. Farm were also one male bovine and other five goats that had symptoms in place and who have given birth kids healthy. The diagnostic tests have ruled out the viremia in all the actual, but the calf, the kid sister of the fetus considered and 3 goats of the flock were positive tests for serum-neutralization (SN) and indirect immunofluorescence (IIF). In another holding in the Province of Treviso a cow tested positive for serum-neutralization test. The animal was tested as the mother of a fetus died 24 hours after birth, sent to CESME for the detection of virus Schmallenberg and negative to the test of real-time RT-PCR. In the month of April 2012 , in a herd of dairy cattle in the Province of Treviso, a cow tested positive for the PCR test for the virus Schmallenberg. It was an abortion at the end where there were no malformations or pathological lesions evident. During the months of November and December 2012 the presence of Schmallenberg virus has been confirmed in Sardinia on 23 holdings in the provinces of Cagliari, Ogliastra, Sassari, Nuoro Olbia and Tempio. Samples of the organs of sheep fetuses with malformations (artrogrifosi, brachignatia, torticollis and scoliosis), were sent to CESME for diagnosis and the test were positive in PCR for the detection of the Schmallenberg virus. In addition, on November 28 a new case was confirmed in a sheep's fetus is malformed in Piedmont in the province of Turin. Italy joins the many European countries that have confirmed the presence of the virus in their territories. 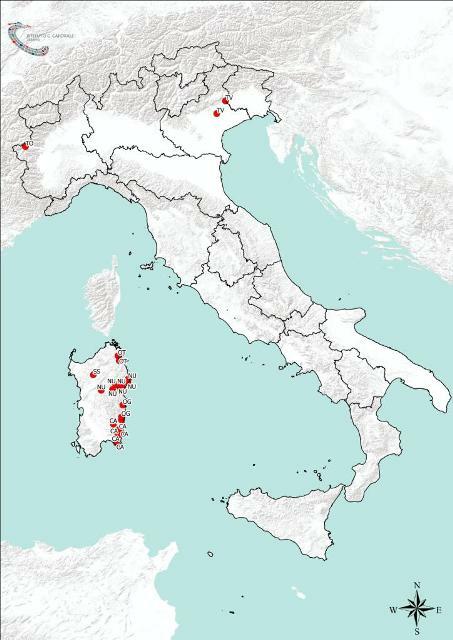 The presence of the virus was confirmed in the vectors of the genus Culicoides in Italy , Belgium and Denmark: 6 pool (Obsoletus complex) collected from September 6 to November 25, 2011 in 3 holdings in the Veneto and Friuli Venezia Giulia, 2 pool (respectively C. obsoletus and C. dewulfi ) caught in the months of September and October 2011 in Belgium and in Culicoides captured in October in Denmark. These results confirm the role of Culicoides in the transmission and spread of the SBV. As of 21 May case numbers and map will be updated weekly. In Germany animals from 2016 holdings have been tested positive for Schmallenberg virus (SBV) so far. The cases occurred in 1062 cattle holdings, 882 sheep holdings and 48 goat holdings. Affected federal states are North Rhine-Westphalia (272 cattle, 273 sheep, 13 goat holdings), Lower Saxony (226 cattle, 143 sheep, 6 goat holdings), Hesse (124 cattle, 137 sheep holdings, 9 goat holdings), Schleswig-Holstein (111 cattle, 102 sheep holdings, 1 goat holding), Rhineland-Palatinate (1 Bison holding, 50 cattle, 43 sheep, 5 goat holdings), Baden-Wuerttemberg (42 cattle, 30 sheep, 6 goat holdings), Brandenburg (24 cattle, 21 sheep holdings), Thuringia (28 cattle, 31 sheep, 2 goat holdings), Saxony-Anhalt (19 cattle, 23 sheep, 2 goat holdings), Hamburg (2 cattle, 6 sheep holdings), Bavaria (153 cattle, 31 sheep holdings, 1 goat holding), Saxony (11 cattle holdings, 36 sheep holdings), Mecklenburg-Western Pomerania (13 cattle, 11 sheep holdings, 1 goat holding), Saarland (1 cattle holding, 4 sheep, 2 goat holdings) and Berlin (1 sheep holding). On sept 11 FLI reported 1,801 positive holdings in Germany. [In case the findings are officially confirmed, the birth of malformed lambs 14 days ago, may indicate that infection had taken place earlier, during the fall months, probably when the ewes were at their 2nd or 3rd month of pregnancy (average length of pregnancy for sheep is 147 days, in fact from 144 to 151 days). Such virus activity is likely to have similarly affected other susceptible ruminants, including cattle. It would be interesting to note if surveillance in ruminants (bovines, ovines, caprines) has been undertaken by the veterinary authorities during 2012 and what results have been obtained. The published presence of SBV in neighbouring counties (Germany since 2011, Poland and Austria -- reportedly -- since September 2012) was predictive of its presence for some time also within the territory of the Czech Republic. Official confirmation, laboratory test results, and notification are anticipated. Schmallenberg virus appeared in the Czech Republic. In the Czech Republic first appeared Schmallenbergsk&#253; virus that infects cattle, sheep and goats. Induces them high fever and deforms unborn offspring. Disease control found so far only two sheep farms near the border with Germany. NADE is the first farm in the Smoln&#233; Kraslick&#225;, another is located in the village Possible to Prachatice. Information Radiožurn&#225;l confirmed by the State Veterinary Administration. Farmers in the Smoln&#233; Kraslic first noticed the disease about 14 days ago. At first they did not pay attention because deformed lambs in animals occasionally are born. But when it came to the fifth similarly damaged lamb, they found that it could be a virus Schmallenberg. He, after an autopsy confirmed the animal's State Veterinary Administration. Virus is typical for different climatic zones, mainly to Africa and Australia. In Europe, it started a year ago, and it is in neighboring Germany. Today it is widespread in other countries of Western Europe. Is not dangerous to humans. "The virus affects cloven-hoofed animals, ie sheep and cattle. For us to be concerned so far only sheep. Basically causes malformed chicks. It's a productive infection, which does not notice any significant breeding, "said Radiožurn&#225;l Veterinary Administration spokesman Josef April. State Veterinary Administration of the situation in the affected farms have only monitored. They are not all infected animals. The number of confirmed outbreaks increases to 18, but we can not speak of an emergency. The most affected are the provinces of Cagliari and Nuoro, necessary to strengthen the prevention and training of field workers. NUORO - The health system has responded effectively, but to avert the danger of a new epidemic requires further study to reduce the risk factors of the disease and improve the training of farmers in the field. This is the figure shown in Nuoro during the proceedings of the conference on the Schmallenberg virus, organized by Zooprofilattico of Sardinia in collaboration with the ASL 3 and the Order of Veterinarians in the province of Nuoro. An event "organized with urgency", a months after the first outbreak, to take stock of the epidemiological situation and of health concerns in the arrival of the virus Sbv island. Since the first case diagnosed in November 22 Tertenia (Og), the number of confirmed outbreaks had risen to 18, officials said experts from the Institute Zooprofilattico (CBM). The provinces most affected are those of Cagliari and Nuoro, with six confirmed cases and 34 suspected, follow dall'Ogliastra, with 3 confirmed outbreaks and 6 suspects. Two outbreaks and outbreak respectively to Olbia and Sassari, while there were no episodes of illness in Oristano and Carbonia. &#171;The veterinary health has demonstrated the ability to respond effectively - said at the opening general manager IZS, Antonello Usai - because as soon as the first symptoms were noted physicians, public and private, have launched the alarm immediately and our laboratories have given answers fast diagnostic. " Along the same lines, Dr. Giovanni Savini, a virologist at the National Reference Centre for Disease exotic (Cesme) of Teramo, who stressed that the experience of blue tongue has allowed us to develop a mechanism for rapid alert and communication at the international level. But compared to a control system which has proved height there is still much to do to avoid the risk factors that favor the circulation of the virus. Disease SBV, in fact, can affect all ruminants and Sardinia has found a "fertile soil" due to the presence of a large sheep and an environment conducive to virus circulation. A disease that can lead to lambs and calves being stillborn or deformed has spread to every county in England and Wales. Some farmers are expected to lose livestock during the lambing season, which is just getting underway. Schmallenberg virus was first detected in the UK earlier this year in the south and east of England. It has spread rapidly during the summer, probably through midges, say government scientists. "We've seen quite rapid geographic spread," the government's Chief Veterinary Officer, Nigel Gibbens, told the BBC. "That means a lot of herds and flocks will have been exposed to the disease. The likelihood is that many of them won't show disease because they weren't infected at the right time to show disease. "Some will - in those herds and flocks we expect an impact of 2-5% of their lambs and calves. In Germany animals from 1992 holdings have been tested positive for Schmallenberg virus (SBV) so far. Affected federal states are North Rhine-Westphalia (272 cattle, 273 sheep, 13 goat holdings), Lower Saxony (226 cattle, 143 sheep, 6 goat holdings), Hesse (124 cattle, 137 sheep holdings, 9 goat holdings), Schleswig-Holstein (111 cattle, 102 sheep holdings, 1 goat holding), Rhineland-Palatinate (1 Bison holding, 50 cattle, 43 sheep, 5 goat holdings), Baden-Wuerttemberg (42 cattle, 27 sheep, 6 goat holdings), Brandenburg (24 cattle, 21 sheep holdings), Thuringia (28 cattle, 31 sheep, 2 goat holdings), Saxony-Anhalt (19 cattle, 23 sheep, 2 goat holdings), Hamburg (2 cattle, 6 sheep holdings), Bavaria (138 cattle, 26 sheep holdings, 1 goat holding), Saxony (11 cattle holdings, 36 sheep holdings), Mecklenburg-Western Pomerania (13 cattle, 10 sheep holdings, 1 goat holding), Saarland (1 cattle holding, 4 sheep, 2 goat holdings) and Berlin (1 sheep holding). cases in previously unaffected areas as early as possible. The two initiatives will therefore cease with effect from today (14 December 2012). France started SBV surveillance again in september. Untill december 12, 99 new cases were found: in 65 sheep holdings, 10 goat hoaldings and 44 cattle holdings. (65 élevages ovins, 10 élevages caprins, et 44 élevages bovins). 69, 70, 73, 74, 76, 77, 81, 84, 86 et 89. Sont concernés : 59 élevages ovins, 7 élevages caprins et 33 élevages bovins. The document has a map, showing a scattered pattern. Worrying reports from Europe about the effects of Schmallenberg disease in its second year has led the National Sheep Association (NSA) to look at ways for the UK to better equip itself to deal with the midge-borne virus. AHVLA and other Government agencies are only collecting data on the distance the disease has spread and do not gather any additional information once the disease has been confirmed in a county. This means there is a concerning lack of data on the level and scale of the problem – a situation that is unlikely to change because of financial constraints created by the Government spending review. AHVLA would be forced to collect the data is Schmallenberg was a notifiable disease, but NSA believes this would not be in the interest of the industry, due to the implications it would have on trade between UK and other countries, both in the EU and further afield. Mr Stocker says: “It would be great if the Government could collect this data, so we better understood the situation and how to implement control strategies, including vaccination programmes once a vaccine is available. However, given the reality of the situation, NSA feels very strongly that industry should pull together and ensure a solution is found. NSA has had preliminary discussions with a number of organisations and hopes to move things forward in the coming weeks. The Schmallenberg virus is moving faster across the UK than bluetongue disease did in the outbreak of 2007, DEFRA chief vet Nigel Gibbens has warned. Mr Gibbens told Farmers Weekly: "We could see a similar number of farms hit by Schmallenberg in 2013 as we did during lambing and calving this year." Throughout the summer and autumn DEFRA and the Animal Health and Veterinary Laboratory Agency have carried out surveillance for the disease, which causes deformations in newborn calves and lambs. Cattle that were infected during the summer showed that the disease had overwintered and was still circulating. "Surveillance has revealed that Schmallenberg is a fast-moving disease capable of infecting a lot of stock. It is using the midge vector more effectively than bluetongue 8," Mr Gibbens said. "Surveillance has revealed that Schmallenberg is a fast-moving disease capable of infecting a lot of stock. It is using the midge vector more effectively than bluetongue 8." The disease has now reached almost every rural county in England and has spread quickly into Wales and Ireland. The coming breeding season will see the effects of the disease showing up again at lambing, but there is some uncertainty on how severely and exactly where it will appear, he said. "The south and east of England will be hit in areas which have not yet developed an immunity. "But the main impact areas, as the virus moves up through the country in a wave-effect, are most likely to be the Midlands, Wales and Ireland," Mr Gibbens said. The Schmallenberg virus has now been confirmed in 11 herds by the Department of Agriculture. In addition to these confirmed cases, blood samples taken from herds in Cork and Wexford have tested positive for virus' antibodies which means that the animals were bitten by an infected midge in recent months. The virus was first confirmed on 30 October from a bovine foetus that was submitted for post mortem in east Cork. In general, the virus causes mild disease in adult cattle, whilst it is not seen to cause any clinical signs in adult sheep or goats. The clinical signs include fever, a drop in milk production and sometimes diarrhoea. When infection occurs in animals that are not pregnant, the impact is very limited. However, if ruminant animals are infected during the early stages of pregnancy, they may subsequently abort or give birth to malformed offspring. The AHVLA update shows numbers by county, however it is a complex or confusing presentation of numbers. One has to make an interpretation to summarize them. However looking at the AHVLA document: this shows a grand total of 715 . This may be explained by holdings with both positive cattle and positive sheep.